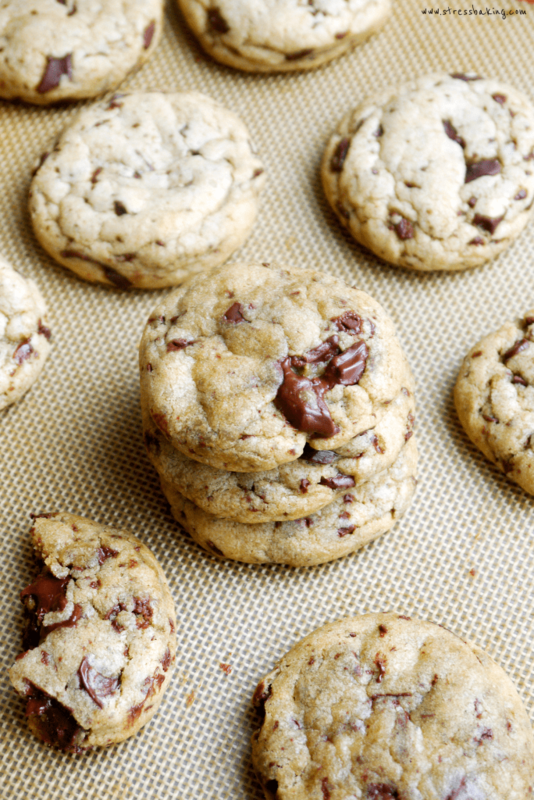 Sweet, buttery dough loaded with chocolate chunks makes for the perfect soft, chewy cookie! Guys… guys. 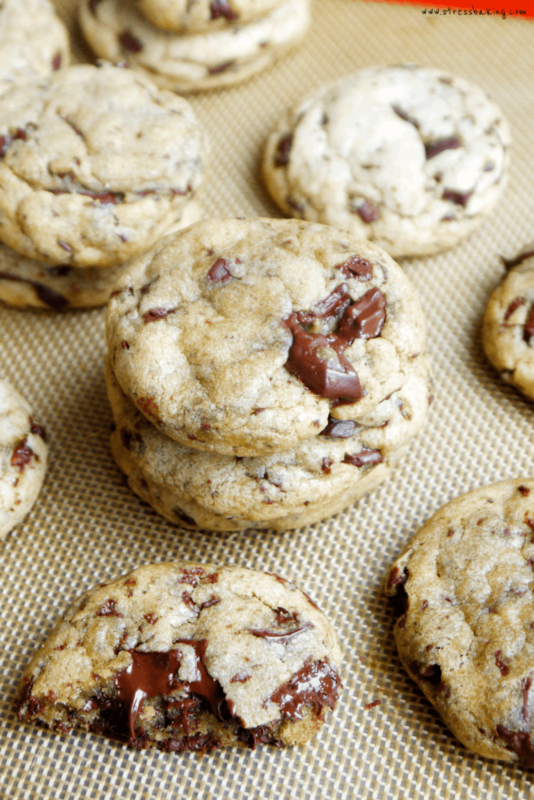 How have I never published my favorite chocolate chip cookie recipe on this blog? How is that possible? These things have been a staple for me for many years, and I’m baffled at the fact that I never put it up here until now. 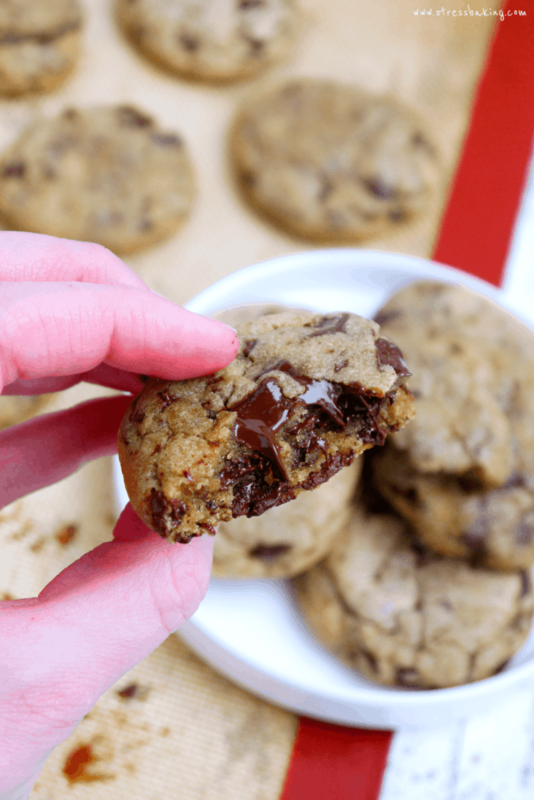 Someone asked me I could send them my go-to chocolate chip cookie recently and I said, “Of course, I’ll send you a link!” and after digging through my own blog archives I realized that it was nowhere to be found. They’re soft and chewy, with a perfectly crisp, golden outside. I’m very disappointed in myself, friends. Very. Because the only thing I love more than the end result is the cookie dough. Ermehgerd the cookie dough. 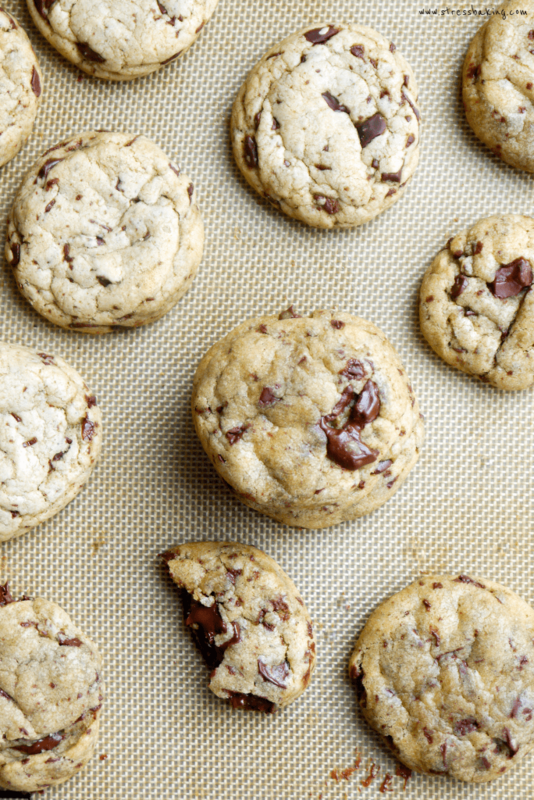 The buttery dough, the chunks of chocolate and specs of chocolate shavings. It’s like artwork to me. 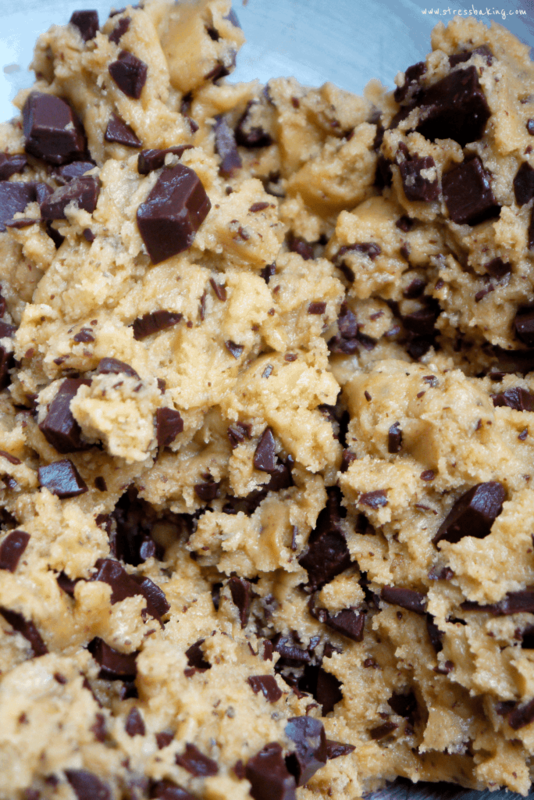 Would it be weird to print out a giant picture of this cookie dough, frame it, and hang it in my home? 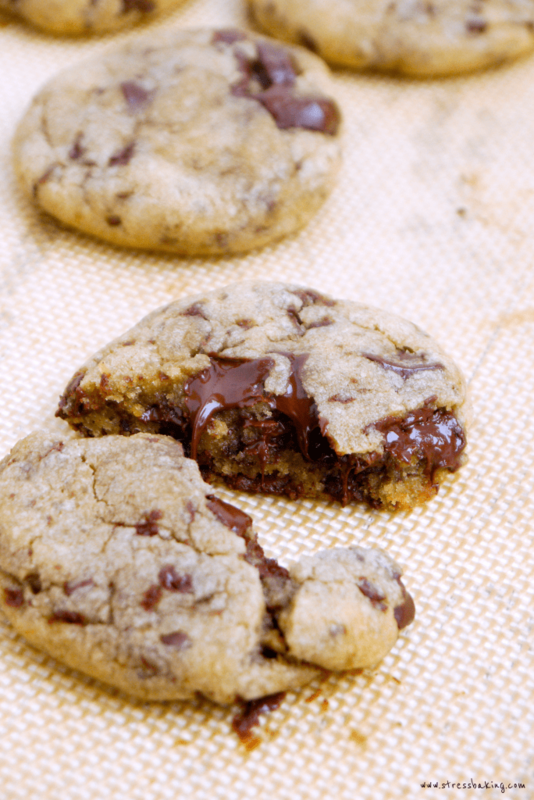 The warm, melty chocolate is just… it’s just the best. I have the hardest time waiting long enough to let the cookies cool before I shove one five in my face. Totally worth my hands being covered in melted chocolate. I know you agree with me, so don’t pretend that you’re above burning your mouth to get them in your belly as quickly as humanly possible. Now, let’s talk about chilling the dough. 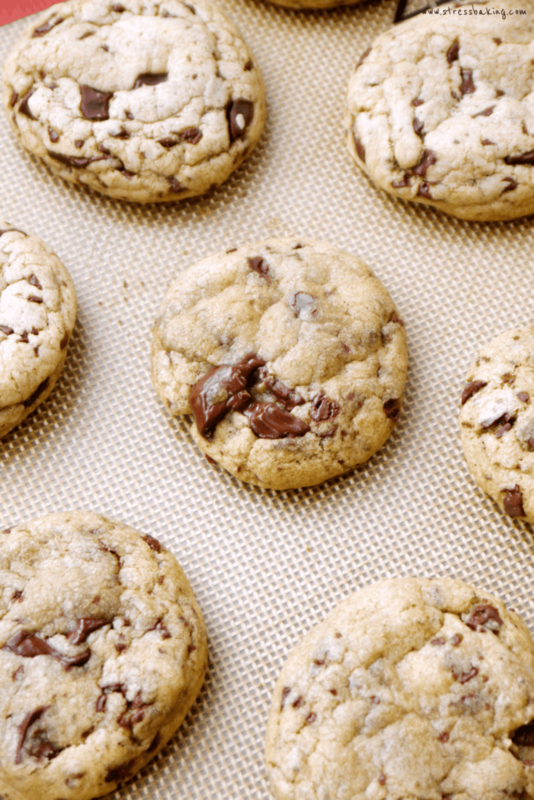 It’s not necessary for the cookies to come out soft and chewy, so you can skip it if you’re short on time/can’t possible wait because you need cookies ASAP. However, I strongly advise you to throw it in the fridge for at least a couple hours. 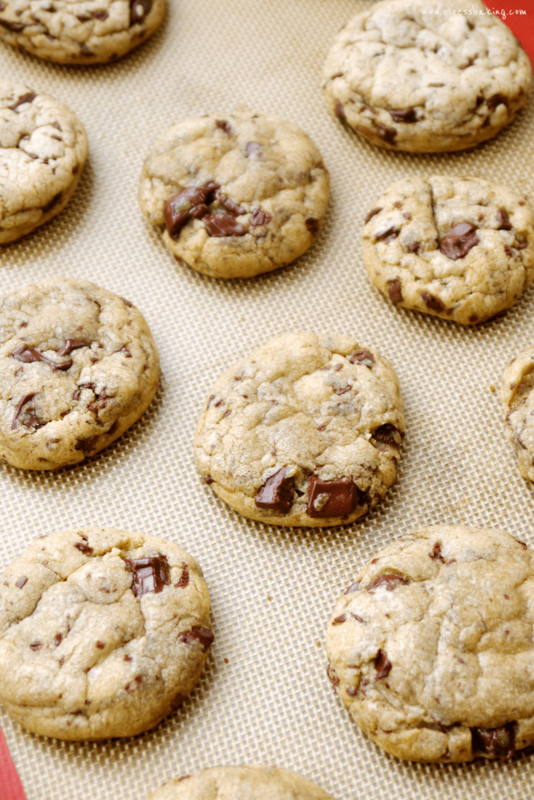 It allows the flavors to fully develop and results in a richer cookie. So tl;dr: if you can wait, wait. It’s totally worth it. You can see a slight visible difference in the cookies below. They all used the same dough and were all cooked at the same temperature for the same amount of time, but the lighter colored cookies at the top didn’t have the dough chilled before baking. Still delicious, but not the perfection that I find the more golden ones to be. I hate to pick my favorite children, but… actually, no. I’m totally okay with it. Maybe I’ll frame the cookie dough and the cookies side by side. Kinda like a delicious and drool-worthy before and after. Way better than framed pictures of flowers – just sayin’. Quick sidebar: Want to know what it looks like when you’re trying to get a shot of the cookie breaking in half, with the warm, melting chocolate taking center stage? ME TOO. While trying to get the aforementioned shot, a cat jumped onto the counter and scared me, causing me to rapidly rip the cookie in half and part of it go flying onto the counter. This, right here, is quite literally a hot mess. Needless to say, I settled for the shot below and I’m more or less completely okay with it since I’m looking at it right now and my mouth is watering. BRB, gotta go make myself a double batch of these bad boys. That might hold me over until tomorrow. Melt butter in the microwave and set aside to cool. In a large bowl, use the paddle attachment on your mixer to beat the butter, light brown sugar and granulated sugar until smooth and creamy. Add the vanilla and egg, beating on low speed until just combined. Add the flour mixture to the wet mixture and mix on low speed until combined. Add in chopped chocolate and stir until evenly combined. 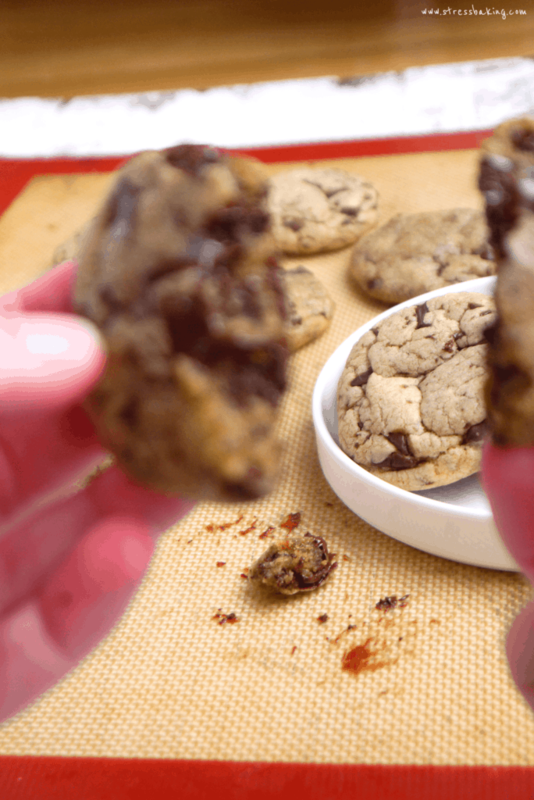 Use a small (or medium) cookie scoop to scoop out even portions of dough and roll each in your hands. Place each ball on parchment paper on a baking sheet or platter, top with a sprinkle of salt (optional, but recommended), cover with plastic wrap and place in the fridge for 1-2 hours to chill. Preheat oven to 350°F and line two baking sheets with nonstick silicon mats or parchment paper. Transfer dough to prepared baking sheets, at least 1-inch apart. I recommend doing no more than 9 cookies per baking sheet, just to give yourself plenty of room. Bake one sheet at a time on the middle rack for 10 minutes, or until the tops have just started to turn golden. Remove from the oven and let cook on baking sheets for a few minutes, then transfer to wire racks to cool completely. Enjoy! – Store in an airtight container for up to 5 days. – You can choose not to chill the dough, but you will get a slightly different result that doesn’t have the fully developed flavor I love so much. Any suggestions of what I could use to substitute eggs on this one? I’m not a crazy dessert eater (weird, I know) but love fresh out of the oven choc chip cookies! Since it’s just a single egg, I think you can get away with 1/4 cup applesauce and 1/2 teaspoon baking powder. You could also try 1/4 cup banana, or 1 tablespoon ground flax seed with 3 tablespoons water. Fair warning that I haven’t tried those in this specific recipe, but it’s worth a shot!